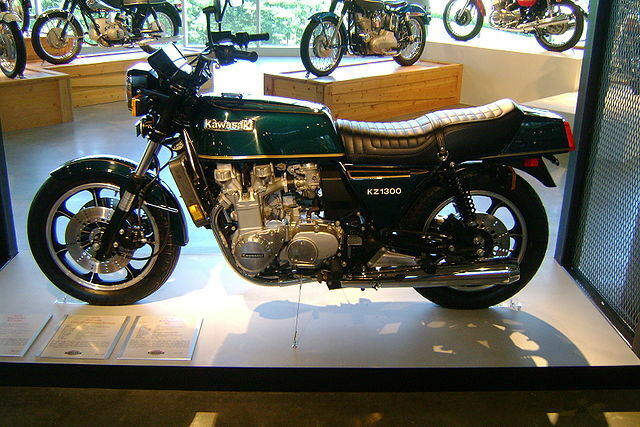 The Kawasaki Z1300's are very unique high performance 6-cylinder motorcycles that were manufactured between 1979 to 1989. 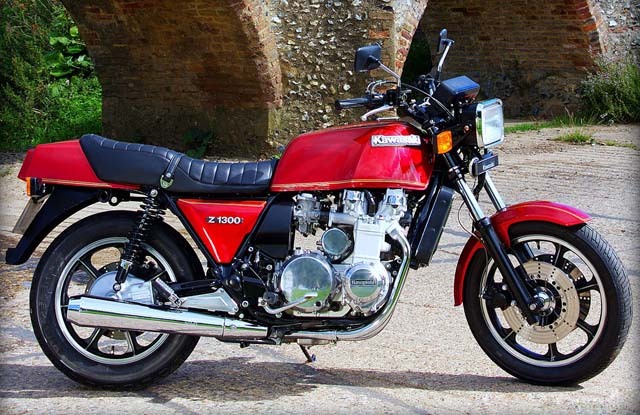 There were 4 different models made over the years referred to as a Z1300, KZ1300, ZG1300 and ZN1300. The one thing they have in common, is that they all share basically the same water-cooled inline 6-cylinder motor. You can see the differences in the various year models in my tech article below named 'model comparison', but also by reading this site and looking at the various pictures I have posted. 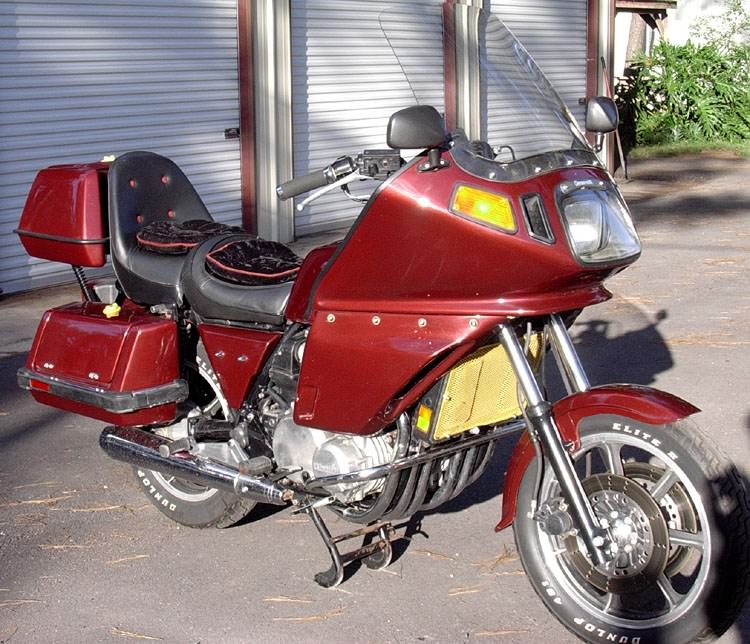 Personally, the last Z1300 I rode regularly was a 1984' ZN1300 Voyager because I prefer the later full dress fuel injection model over a base KZ1300. The 6cyl Voyager has a 4" lower seat height than the KZ1300, F/R dual adjustable air suspension with an onboard air pump, DFI fuel injection, digital dash, AM/FM Radio / Cassette / CB / Intercom combo, full fairing that blocks wind as good as any new bike on the market today, large detachable bags and trunk, and other state of the art features for its day and time. It will also keep up with pretty much any new touring bike made these days and still gets 42 mpg on average when it's in proper tune. I had mine to 125 mph once and it was still pulling strong, so there's no telling how fast it will go if you stay in the throttle. 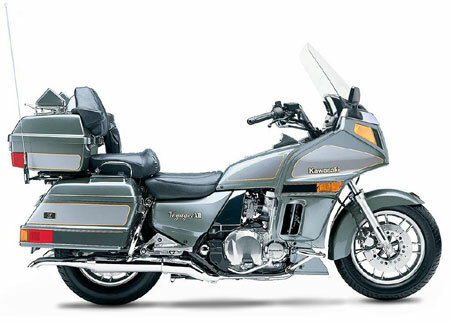 The 6cyl Voyager was discontinued in 1986, even though they were still officially being assembled by Kawasaki and sold in dealerships through all the way up through 1989. 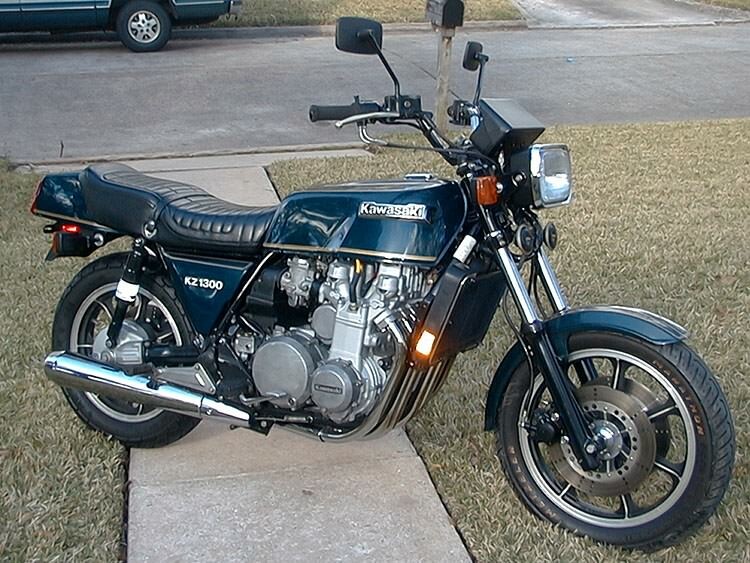 They were replaced with an inline 4-cylinder ZG1200cc Voyager that started as a 1986 year model. 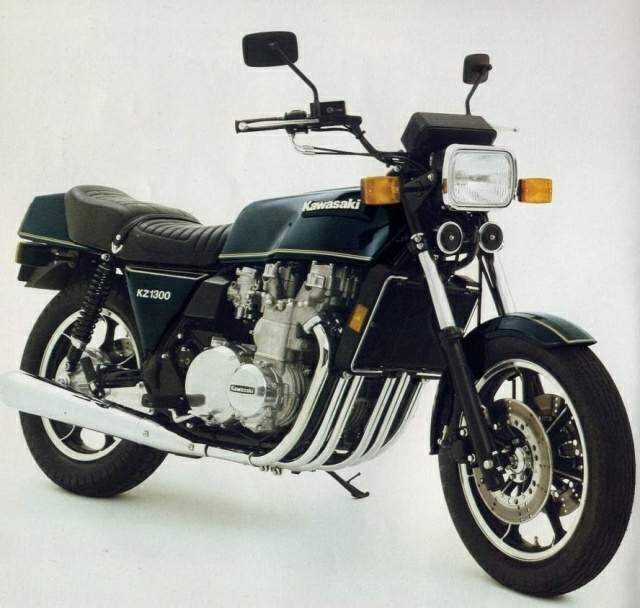 The newer 4cyl Voyager looks similar to the style of the ZN1300, but these are entirely different bikes with almost no parts that interchange. 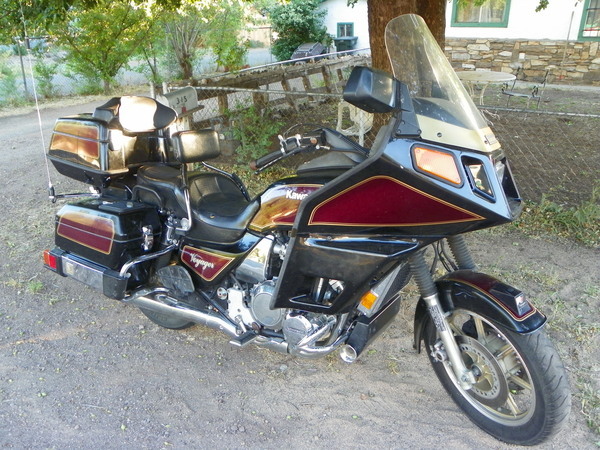 The 4cyl Voyager was discontinued in 2003 as I understand, and the new 2010 Voyager uses a 1700cc V-Twin which no doubt, really doesn't interest the diehard 6cyl lovers. It's that unique sound of the six cylinder for one thing, and/or the physical size, stability, power and speed of the Z1300 that others love. 6 cylinder, watercooled, 1300 cc engine. Front dual disc & rear disc brakes, shaft drive, cast wheels. Z1300, другое название KZ1300 изначально планировался как спортивный мотоцикл, чтобы конкурировать с Honda CBX, но в конечном итоге из-за большого веса и карданной передачи, мотоцикл стал использоваться для путешествия. На Z1300 устанавливался крупнейший рядный шестицилиндровый двигатель. 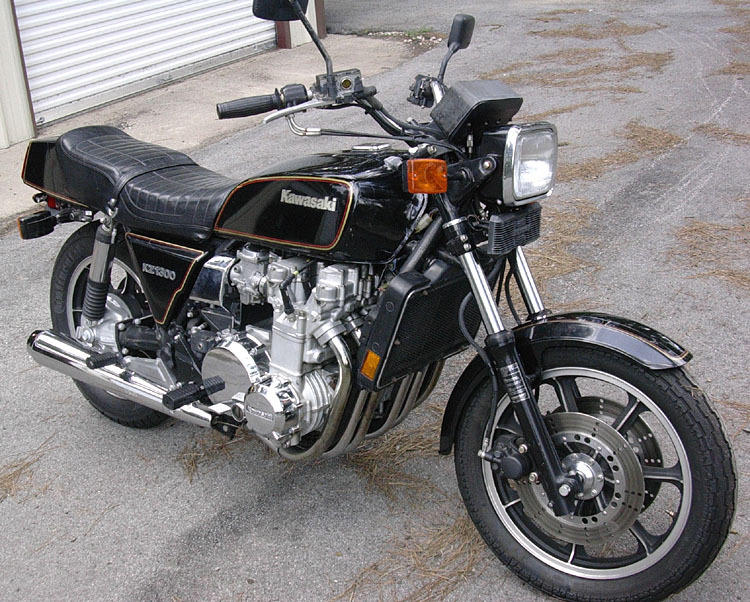 Первоначально Z1300 оснащались карбюраторами, но в период с 1979 по 1989 на нем были сделаны несколько новшеств, среди прочих, была введена цифровая система впрыска топлива. Модель для США выпускалась с обтекателем кофрами для багажа и называлась Z1300 Voyager. 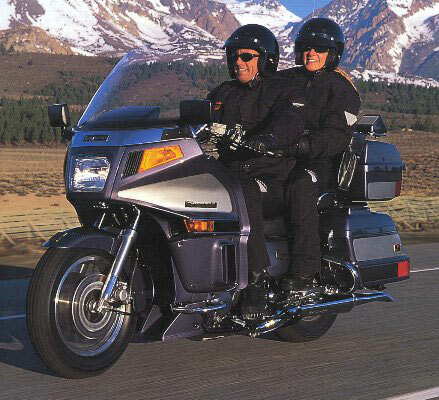 Мотоцикл был похож на GoldWing Honda. 200 последних моделей, построенных в 1989 году получили дополнительный титул "Легендарной шестерки". Другими словами, машина стала мифом, чему Z1300 обязан своим особым положением и техническими возможностями именно двигателя. Есть только один серьезный косяк - кончина пружины натяжителя цепи грм, и соответственно пластикового зубчатого ролика (как на ременных моторах, только тут он взаимодействиет с цепью) вызывает загибание клапанов, коих новых и на складах уже не осталось. Ремонт дорог. Лечится установкой более совершенного натяжителя от ZX 11. Шасси/рама: передняя вилка гидравлическая с диаметром труб 41 мм / Задний маятник гидравлический на двух амортизаторах. 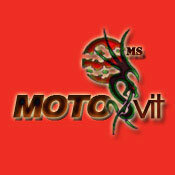 Engine Liquid cooled, four stroke, transverse six cylinder, DOHC, 2 valve per cylinder. Jama Exhaust - 6 into 2 exhaust previously available from a company in Denmark. One of our members, Nigel N. in the UK says he bought the last set that was made near the end of 2003. Z1300 DFI Conversion - Phase 1 - Changing carb's to Fuel injection on a test-bed! Z1300 DFI Conversion - Phase 2 - Converting the first KZ1300 to DFI! 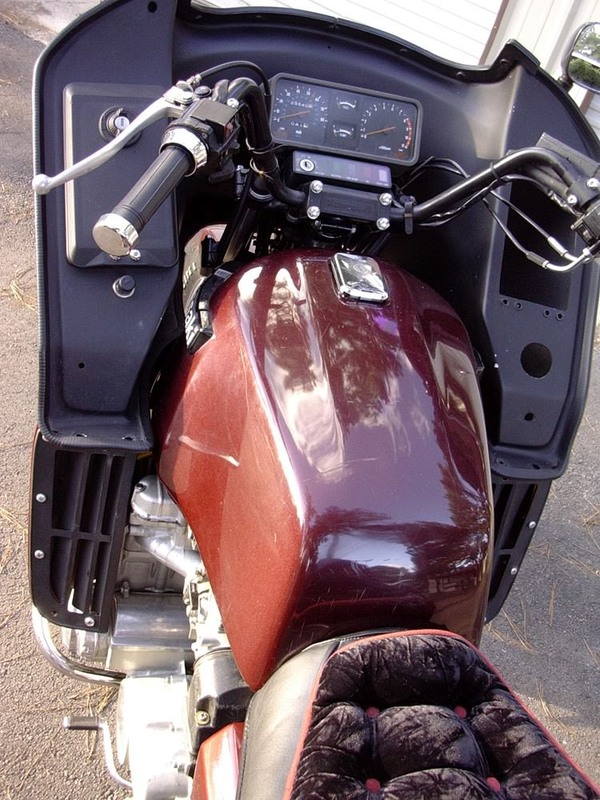 Z1300 DFI Conversion - Phase 3 - The DFI Conversion Kit! Main Switch - Adding a main switch to your Voyager! Steel Braided Brake Lines - Installing steel braided brake lines! Steering Stem Bearing Repair - Grease your bearings or replace... your choice! 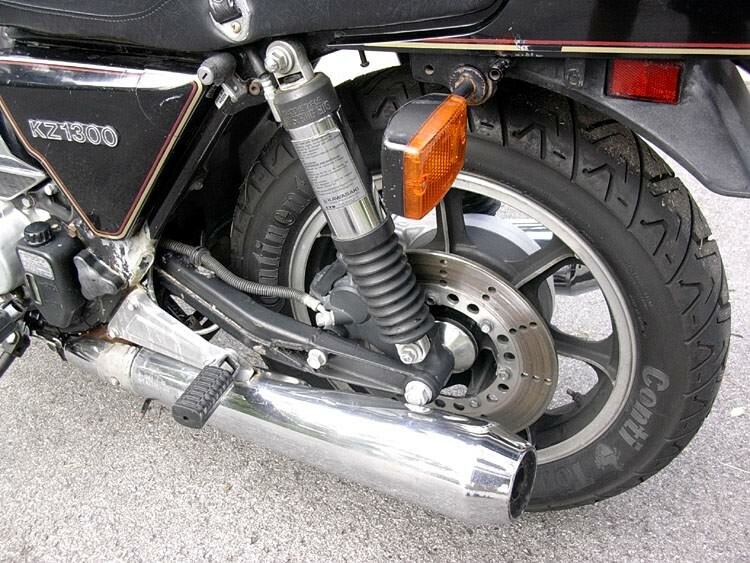 Fork Oil Maintenance - Check those front forks when you buy a used bike! Fairing Repair - Fixing a ZN1300 front Fairing! Driveshaft Spline Service - Do it when you replace your rear tire! Engine Stand - Making an engine stand for easier service! 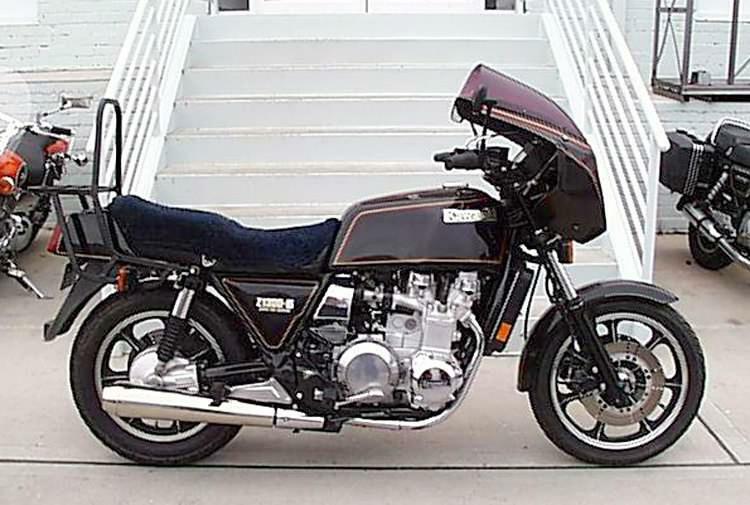 Model Comparison - Comparison of 79' - 89' Z1300, KZ1300, ZN1300 and ZG1300! Pingel Fuel Valve Mod - Installing a Pingel Petcock on a KZ1300 & ZN1300! 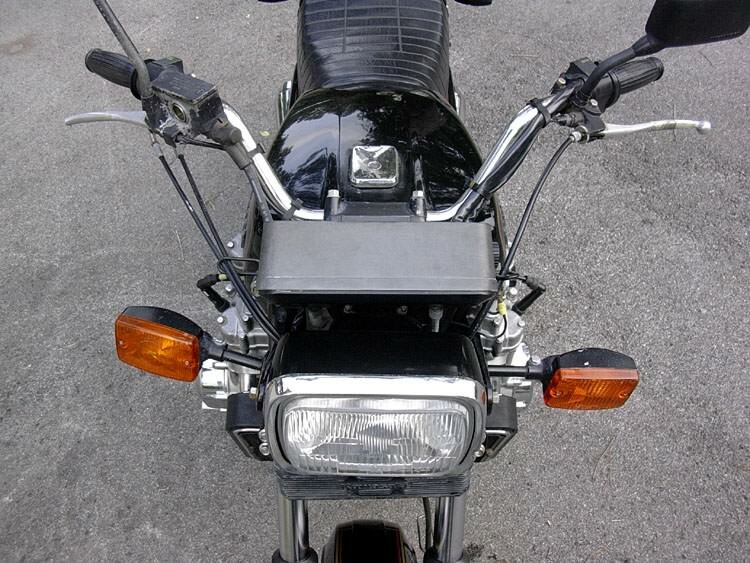 Fork Ear Comparison - Comparison of 79'/80' and 81' & up headlight brackets! ZN1300 Clutch Conversion - Swapping a Z1300 clutch into a Voyager 1300! POR-15 Gas Tank Prep - Permanent coating to remove rust from your gas tank! Z1300 Pinion Gear Comparison - Update your small pinion gear and drive shaft! Hydraulic Clutch Mod - Installing a ZX-1100 hydraulic clutch and master cylinder! Valve Adjustment - Adjusting valves and checking the cam chain idler gear! Fuel Injector Service - Voyager Fuel Injector service, Regulator, Air Filter Mod! Cam Chain Tensioner - Installing a ZX-11 tensioner! Hawker Odyssey Battery - Upgrade your battery for easy starts! 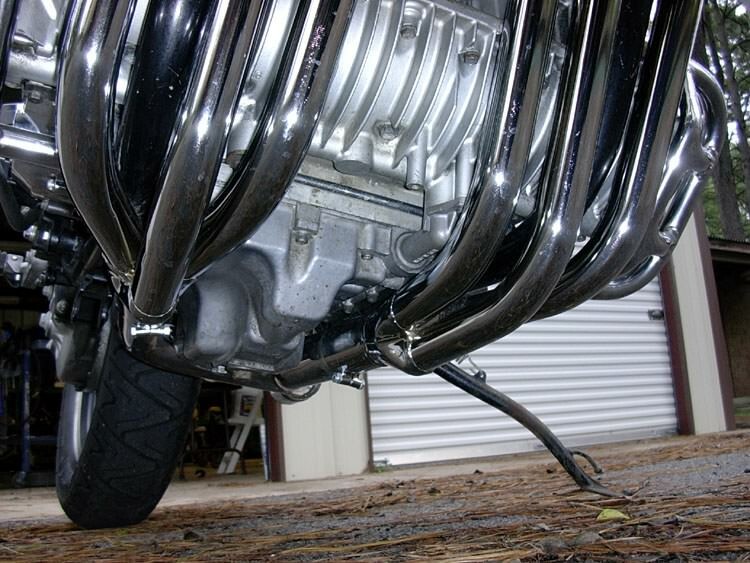 Installing Air Shocks - Progressive Suspension Air Shock install on a ZN1300! Nology Coil FAQ - Installing the German made Nology coils and wires! Deep Sump Pan FAQ - Comparisons of the small sump versus deep sump oil pans! ZN1300 Fuel Pump FAQ - A look inside a ZN fuel pump! ZN1300 Backrest - Installing a Markland backrest! Valve Shim Cross-reference - What other bikes use the same shims! Carb Close-ups - Close up carb pictures and fuel line routing! GM Coil Swap - Automotive coil install courtesy of Bob in Canada. External Battery Cable - How to add an external battery cable! 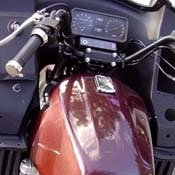 Dyna 2000 Ignition - Info on the Dyna aftermarket ignition units! Not sure if these are still available. LED Charging meter - Cheap and easy way to monitor your charging system! 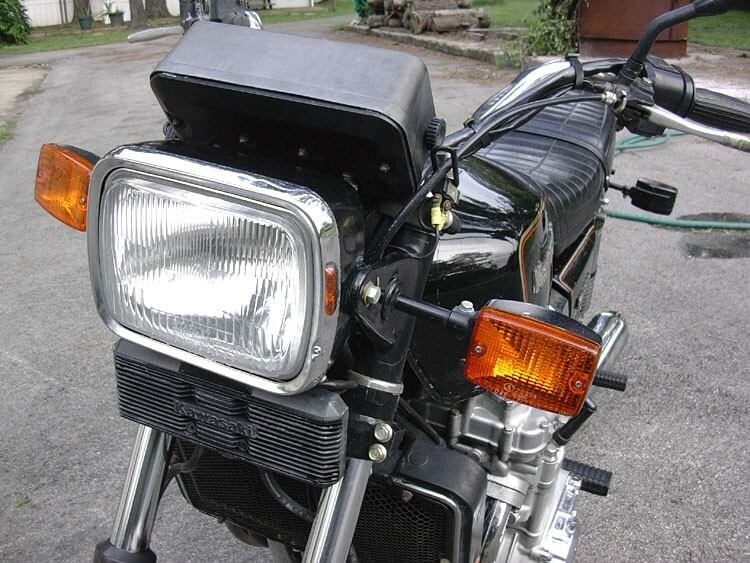 Air Box Cover Repair - Fix your covers before they break! Engine Removal - How to pull an engine! A1-5/B2 Frame Comparison - Differences between the 'A' and 'B' style frames! 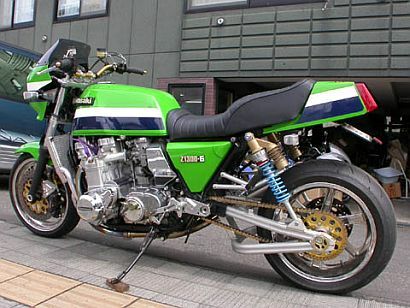 With bikes like the H1 500, the K2 750 and the Z900, Kawasaki earned a reputation for making the fastest and the most fearsome roadsters available. 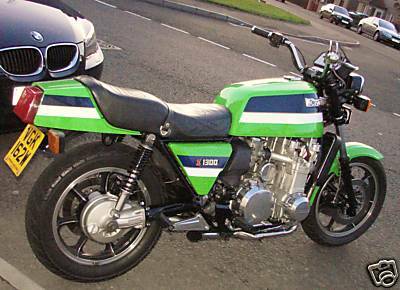 As the 1970s wore on, although the 900 grew into a 1000, the opposition began to catch up, overtake and zoom ahead with their own scorching road burners. 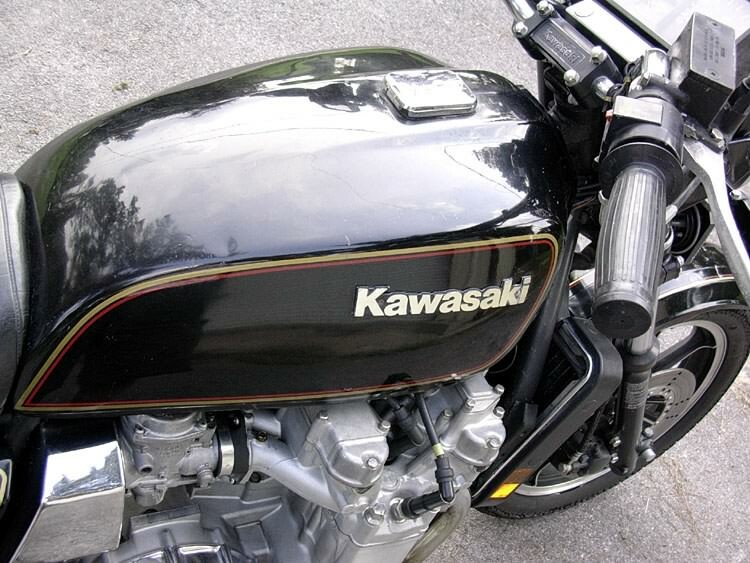 Since 1973, however, Kawasaki Heavy Industries had been working on a new 'King' to wrest the laurels from its Oriental rivals. The brief was simple, the bike should be a 1200, have six cylinders and because of the company's expertise with such a layout, should have an in-line engine. Development continued slowly but surely on those lines until it was decided that, due to the bike's inevitable weight penalty, an even larger power unit was necessary. 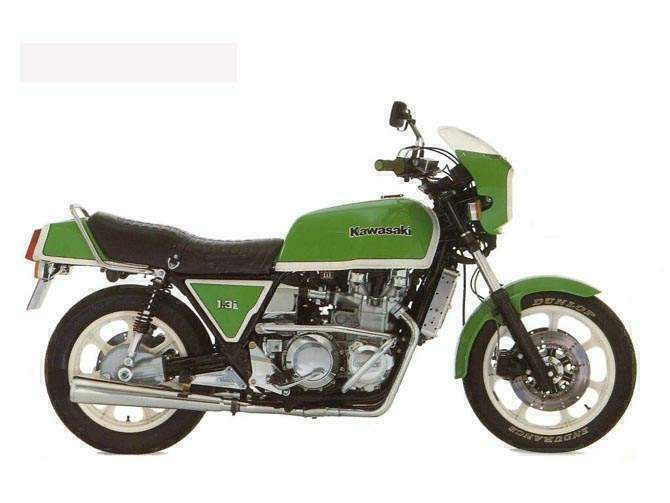 So when the new Kawasaki bike was announced to the press in late 1978, it was designated the Z1300 and featured a 1286cc engine. 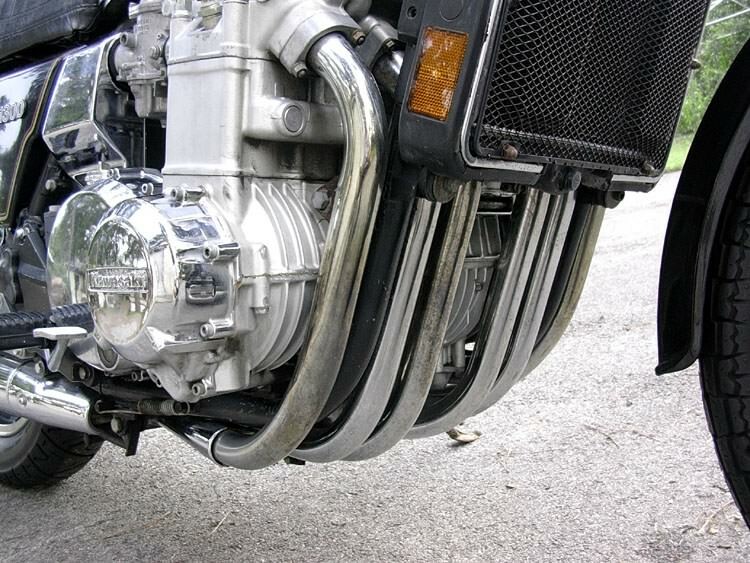 The width of a six-cylinder power unit mounted across the frame presents the biggest problem for designers because it limits banking angles and thus impedes rapid cornering. Such a unit also presents a large frontal area to the wind and makes manoeuvring in traffic somewhat perilous. 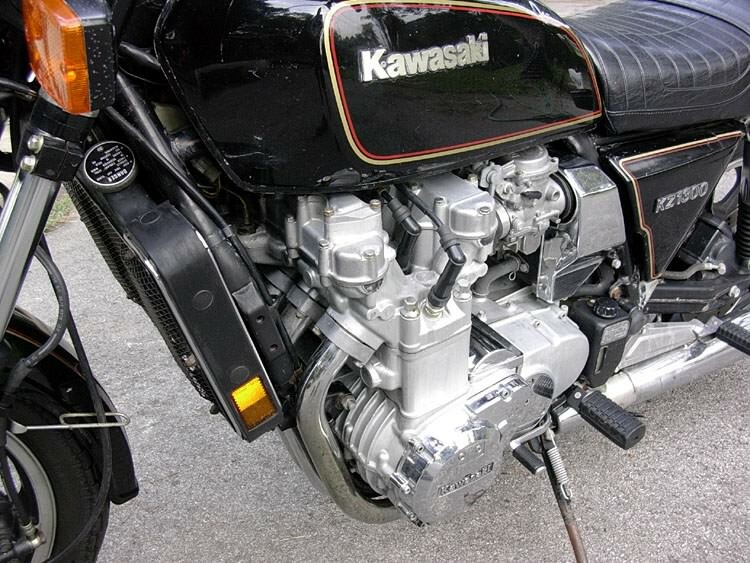 Kawasaki's answer to the problem of making a compact six was to utilize water cooling. With water jackets around each cylinder, the gaps between can be narrower than if air is relied on for cooling. 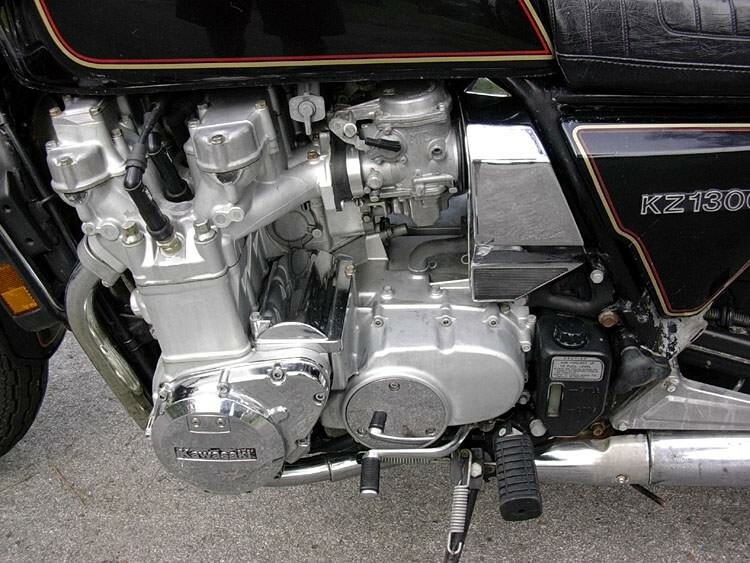 Although the Z1300 is rather large from crankcase end to crankcase end, the rest of the engine looks more the size of a big four. Of course, another advantage of water cooling is that it provides good sound insulation and this well-balanced six is notably quiet and smooth with few peers in this respect. 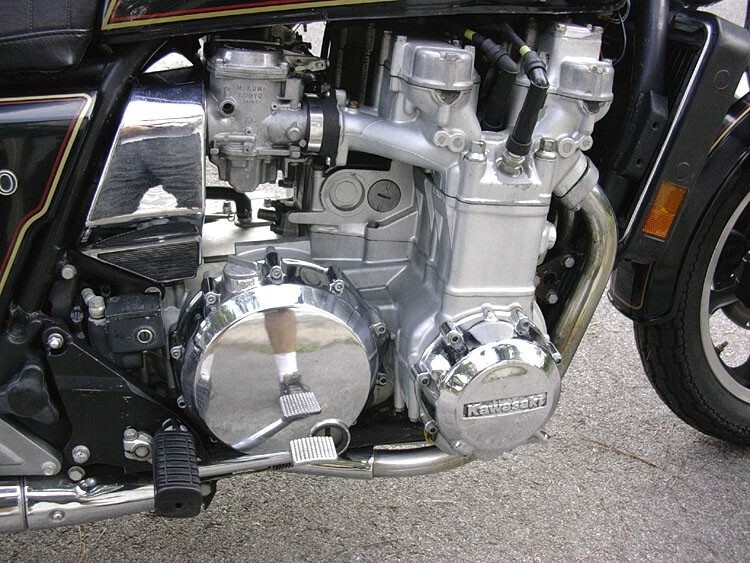 Difficulty was found in accommodating the customary one carburetor for each cylinder, so the decision was made to use three twin-choke constant-vacuum carburettors. 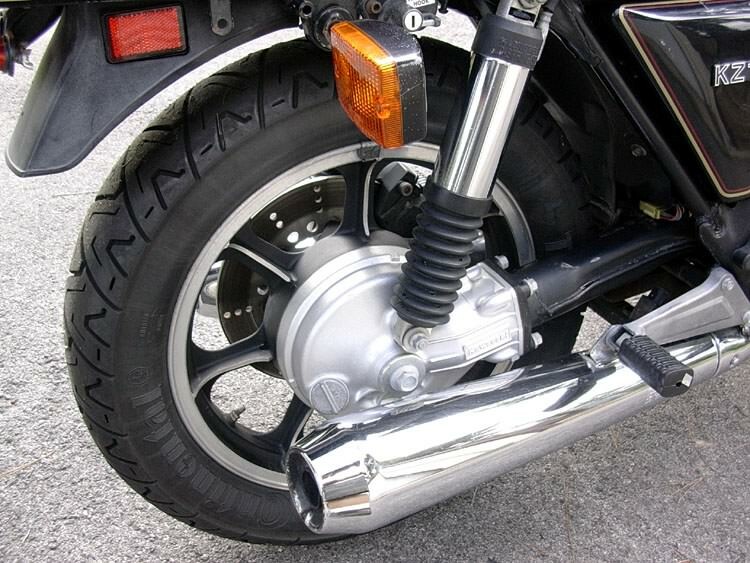 These were found to be more compact and fitted underneath the fuel tank without impeding the rider. The fuel mixture enters the combustion chambers by way of a single valve per cylinder, the company thinking that the expense of the four-valve-per-cylinder system was unjustifiable. 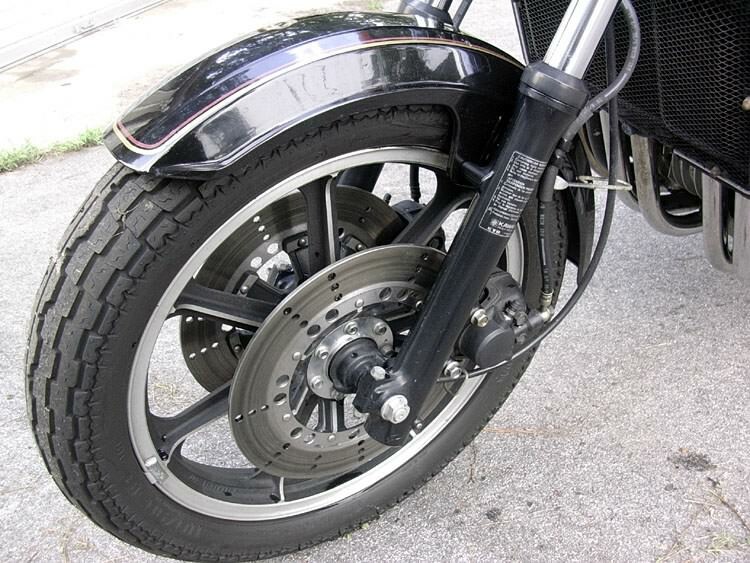 Power is transmitted through a five-speed gearbox to a shaft drive, mounted on the right-hand side of the bike. With a weight of 640 lb to propel, and all of 120bhp to transmit to the 17in diameter rear wheel, it was obvious that a chain would just not be up to the job. 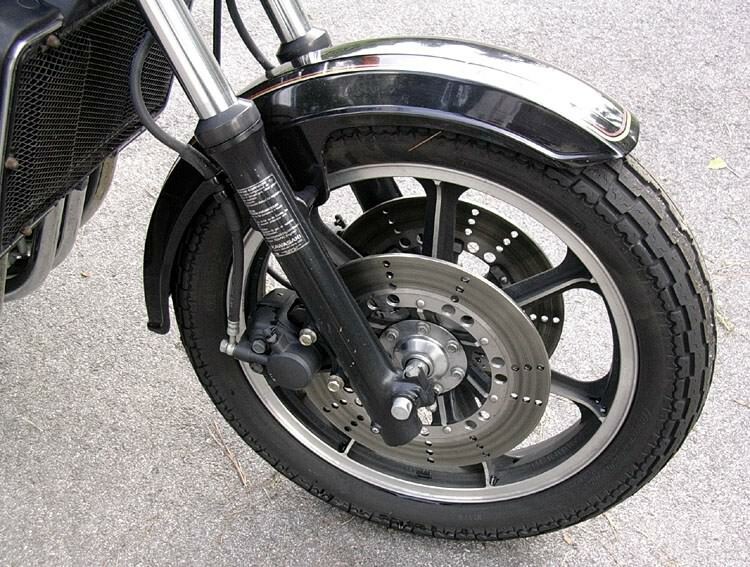 Braking is taken care of by triple discs using the Kawasaki system of sintered metal pads, (two front, one rear). Surprisingly, once under way the bike is quite easy to ride and does not feel at all like the heavyweight it is. The engine is smooth and powerful and urges the machine forward at an even and very rapid rate. There is no noticeable power band as such, just one turbine-like surge right up to the 8000 rpm mark. This corresponds to 135 mph in top gear, although a few more mph can be extracted if you risk running into the red sector of the rev-counter. Acceleration is certainly in the top bracket with a standing-start quarter-mile time which just reaches into the 'elevens'. There are one or two bikes which are faster but they are a fair bit lighter and not quite so comfortable. Another pleasant surprise is the machine's fuel consumption which is quite low and always on the good side of 40mpg. 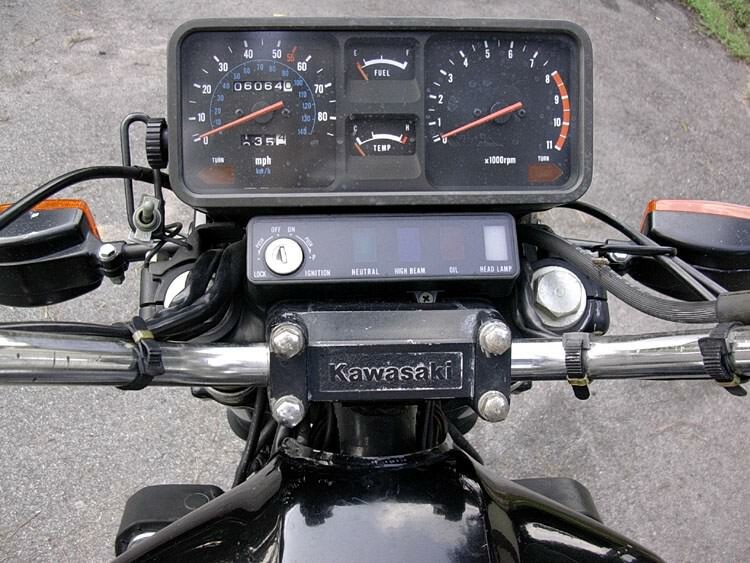 The instrumentation and switchgear of the bike are just what you would expect of a Japanese bike for the 1980s, and they are just about perfect for the job. 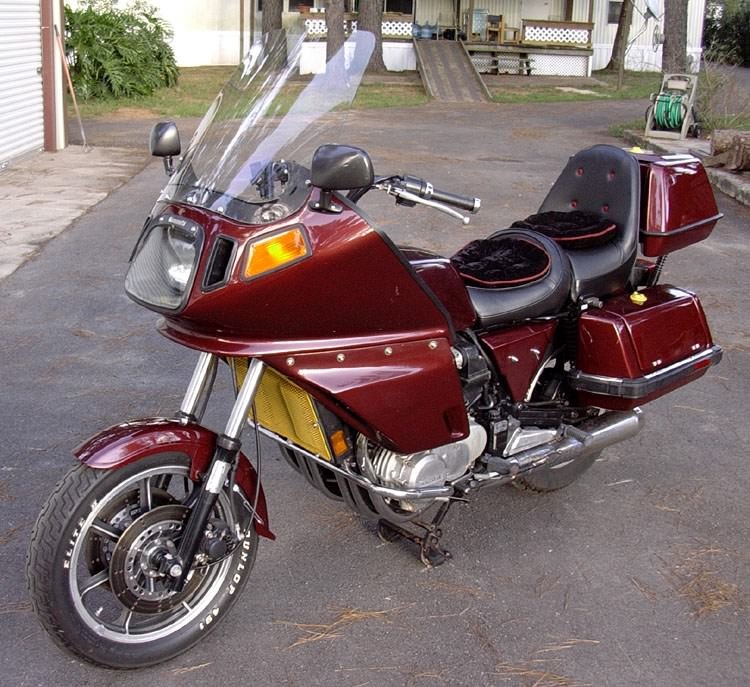 The Z1300 has a large comfortable saddle which makes long-distance touring very comfortable indeed. It is hard to say just how big bikes will get before the trend to 'bigger and faster' stops, but critics should not dismiss the new Kawasaki as the ultimate unmanageable monster. It is in fact smooth, fast and easy to ride and an interesting step in the development of the powered cycle. 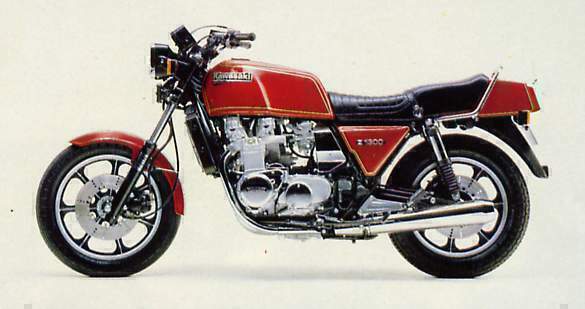 The Z1300 was shown to the world at the Koln show in September 1978. The engine a liquid-cooled 1286cc DOHC two valve per each of the six cylinders sat in the bike which had a massive dry weight of 297kg. 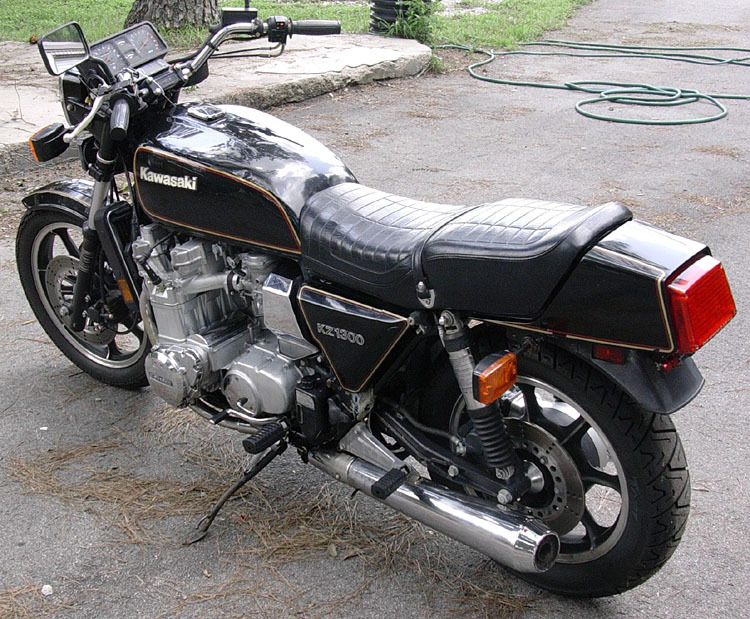 This was the "dreadnought" of touring bikes. 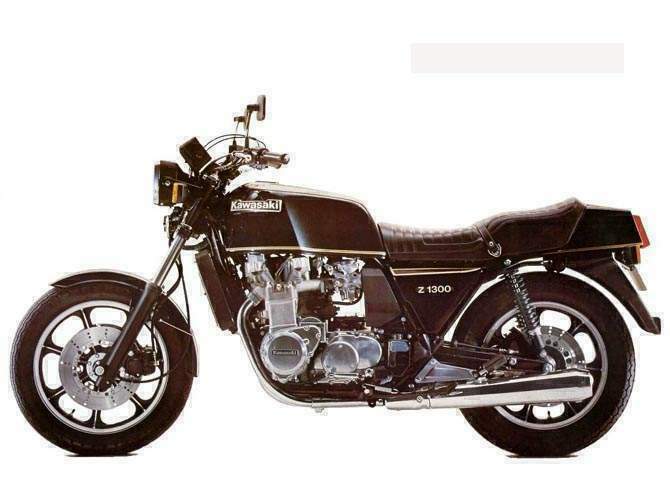 In November 1978 the press were introduced to the Z1300, in Malta for the European press and Death Valley California for the American press. They were unanimous with praise for both styling and impressive performance of the ground breaking machine. 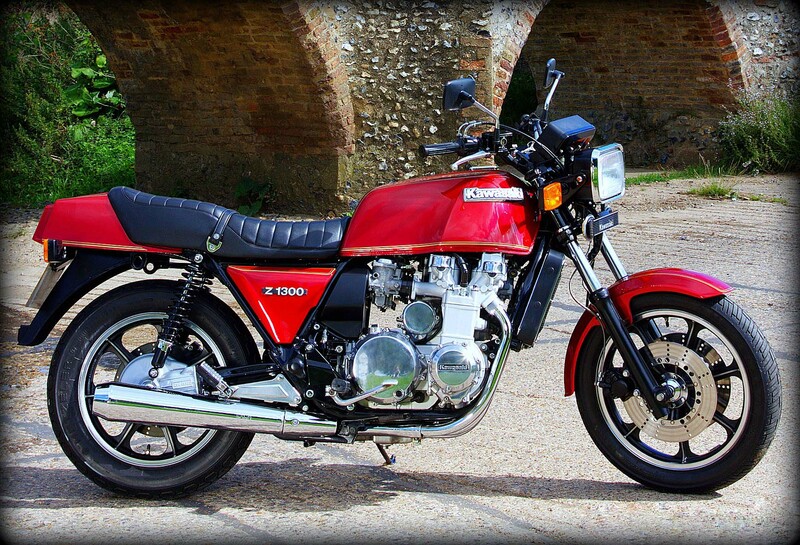 The Z1300 was produced from 1978 until bowing out in 1989. 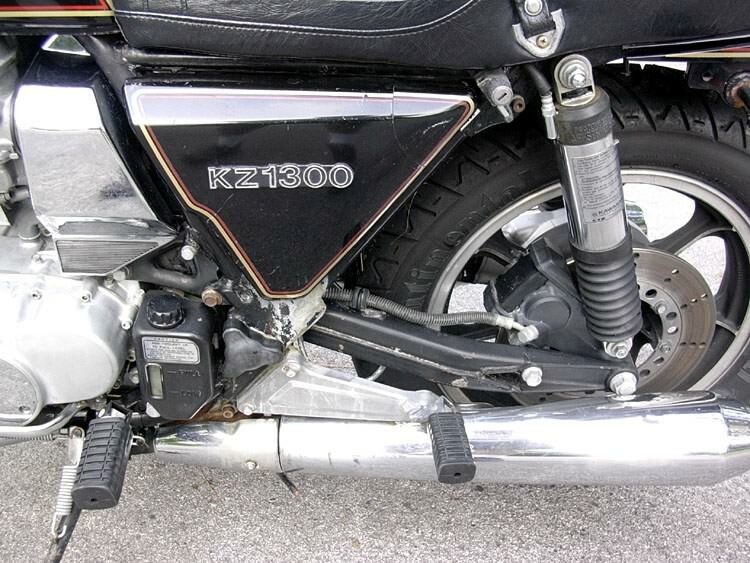 In 1983 the Z1300 was given a digital fuel injection (D.F.I.) 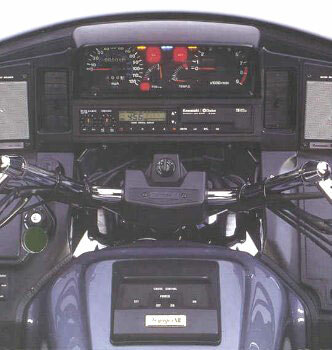 and was called the ZG1300, the system installed to improve fuel consumption gave a gain in power and torque. In march of 1983 the Voyager was launched, a fully dressed tourer:- it featured a fairing, panniers, top box, stepped seat, digital speedometer, radio/cassette deck and on board computer for trip and fuel calculations. The Voyager was a big hit with serious touring riders despite its higher price than its competitors. 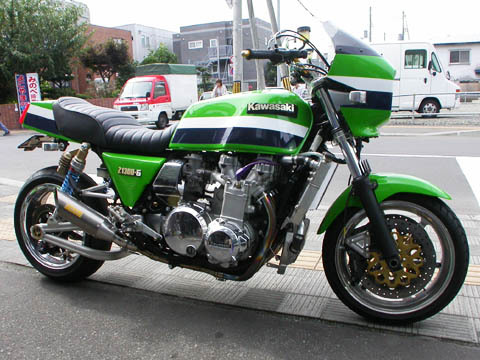 After its 12 year run the Z1300, Kawasaki's first liquid cooled six cylinder engined bike ceased production in 1989. 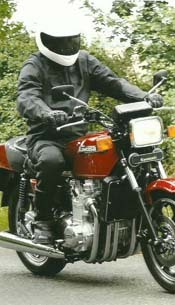 20,000 Z1300's and 4,500 Voyagers had been produced. 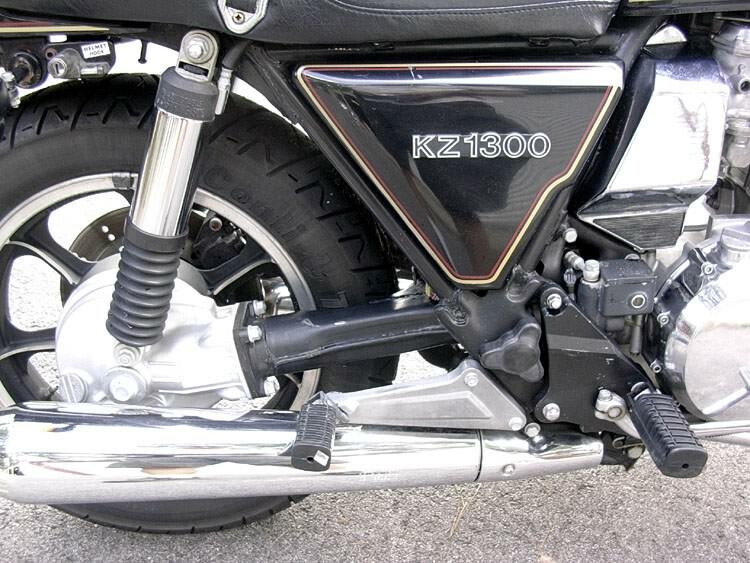 Today as we stand testament for the Z1300 is still a popular choice for many bikers. 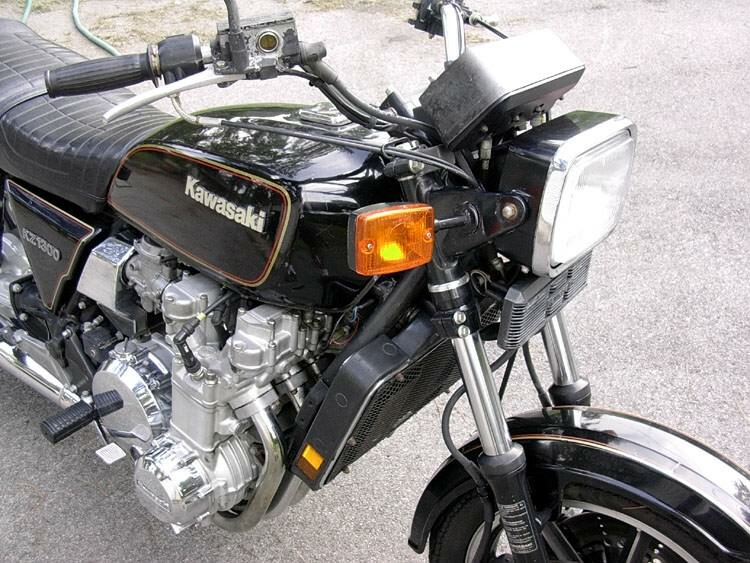 In 1978 Honda and Benelli had a six, Kawasaki were to be different. 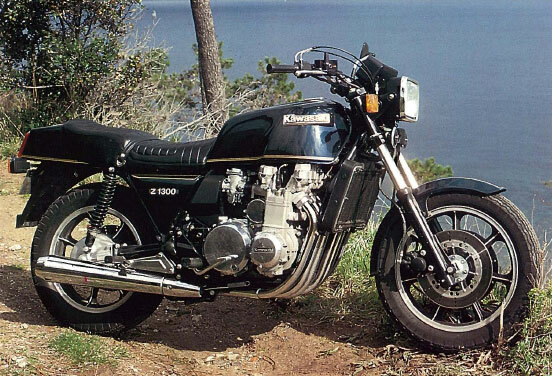 The Z1300 was a six with water cooling and shaft drive:- the ultimate sports tourer. It was the heaviest at 297kg but the 120bhp was more than enough to power the bike to over 145mph. It soon found admirers all over the world. The 1286cc motor was smooth and a masterpiece of design and easy to work on. 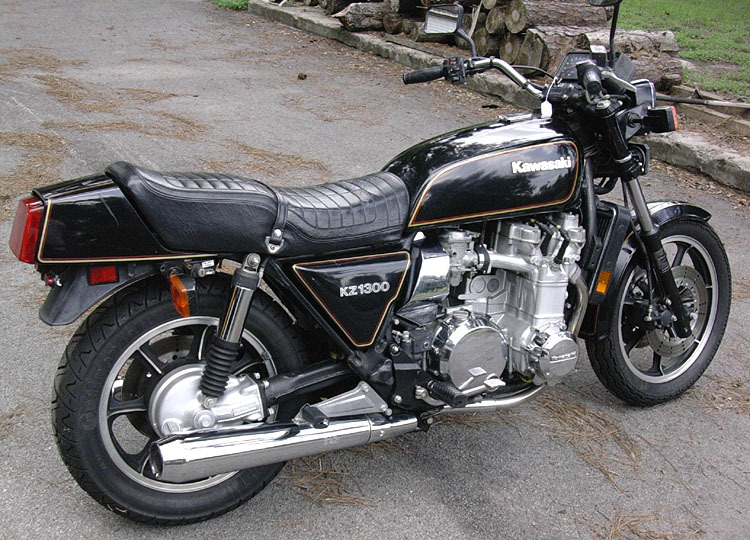 The Z1300 was the "King of the road". This the first model was only available in one colour, starlight blue with gold pin stripe. 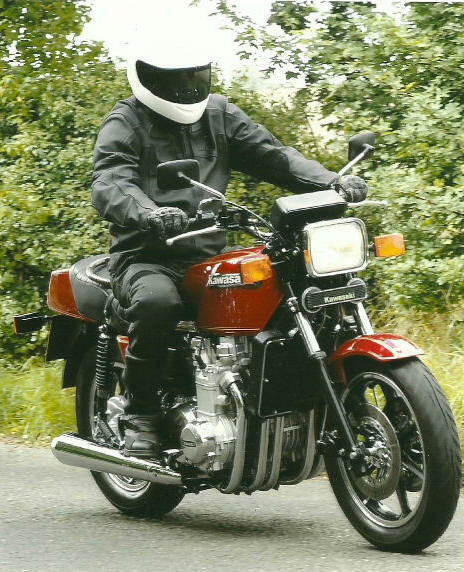 The Z1300 handled better than it should have and surprised many of the reviewers at the time. The brakes were poor and it had little ground clearance. 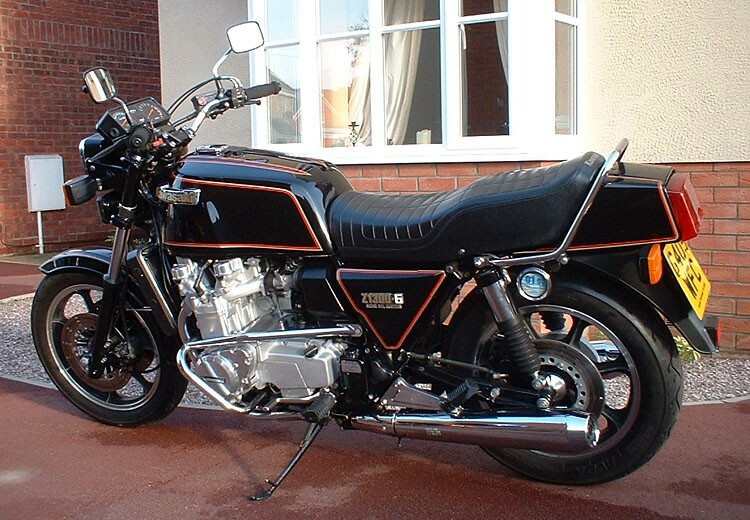 But the Z1300 was in a class of its own. The A2 was offered again in only one colour: ruby red. The A2 was an improvement over the A1, the sump was much bigger: A bid to counter act the crank problems the A1 had experienced. It was increased from a capacity of 4.5 litres of oil to 6. This model was not released in the UK, being mainly a US model. 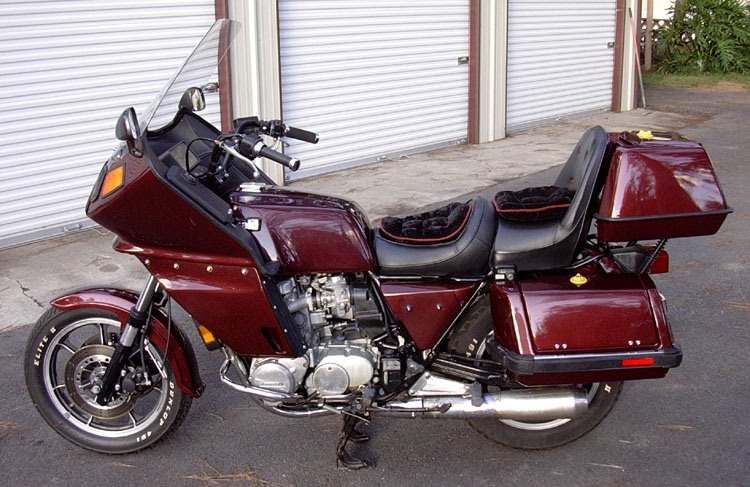 It was basically a Z1300a with a fairing, top box and panniers. Again only one colour was offered: Royal dark red. The heaviest bike got even heavier. 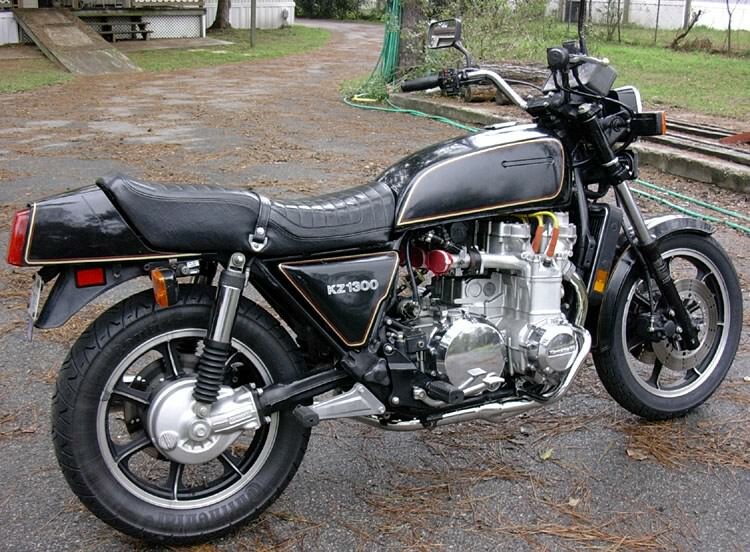 Remarks: Touring model of KZ1300-A. 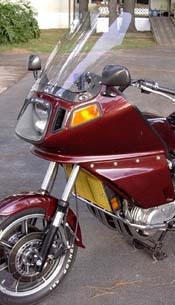 Tail trunk & saddle bags, fairing. The A3 was available in two colours: Holy green and Ebony. 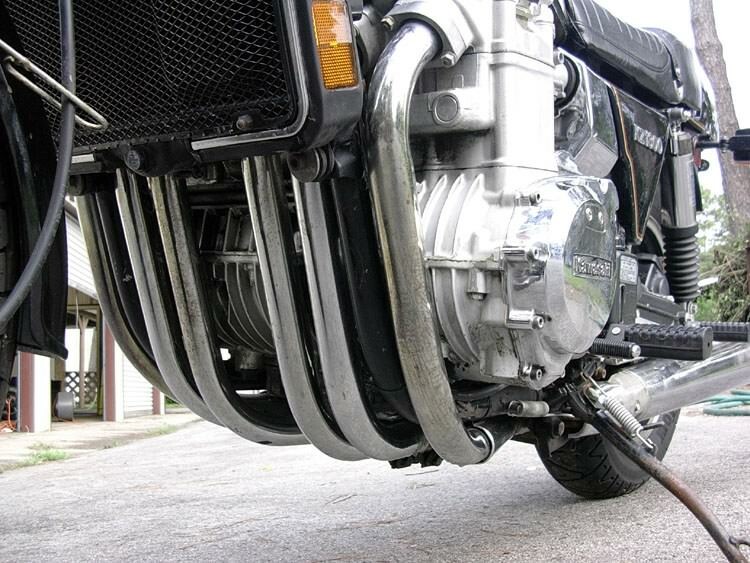 A chrome grab rail was fitted and the outer engine cases and air filter covers were chromed. 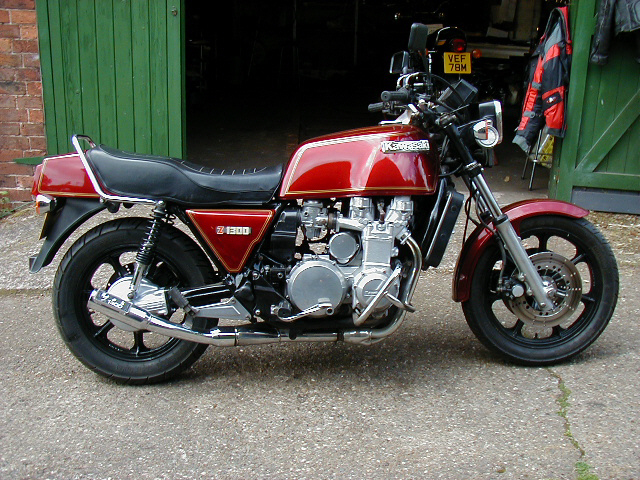 The electronic ignition was modified and gas rear shocks absorbers were fitted. The A3 was now also being built at the Lincoln factory in The USA. 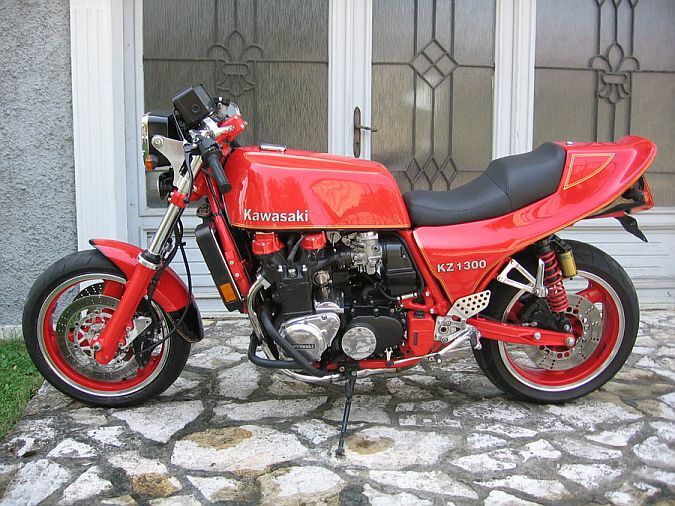 1982 saw few differences in the Z1300, it was offered in two colours: Passion red or ebony. The CDI pickups were moved and the horn covers were changed. The A5 had even few differences than previous models, the badges were changed but it was offered in the same colours. В 1983 году Z1300 получил цифровую систему впрыска топлива (DFI) и был назван ZG1300, которая была установлена для улучшения расхода топлива, что дало прирост мощности и крутящего момента. 130.00 л.с. (94.9 кВт)) @ 8000 об./мин. 1984 Saw a big change, the introduction of the digital fuel injection. the power output was now 130bhp. The colour were the same still: Red or ebony. The outer cases and side panel badges were modified. 1985. No new model. Sales were slowing. More or less same bike same colours. 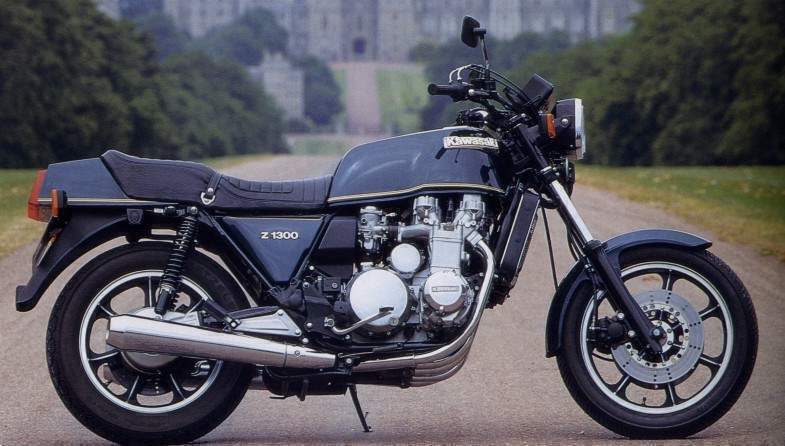 The Z1300 was now only offered in one colour: Ebony, only a handful of UK sales being made. 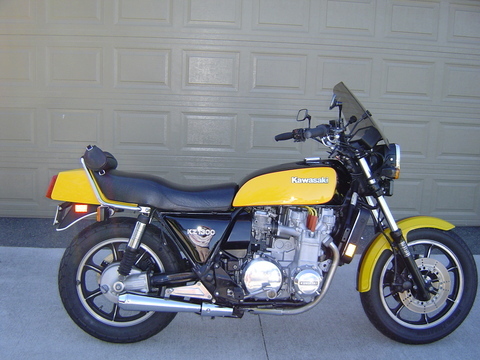 Sales of the Z1300 were almost at a stand still and this model was being sold until 1993. 130.00 л.с. (94.9 кВт) @ 8000 об./мин. The ZN1300 Voyager: - "a car without doors"
В марте 1983 года на базе Z1300, мотоцикла с шестицилиндровым двигателем жидкостного охлаждения, был запущен в серийное производство, рассчитанный, прежде всего на американский рынок, Voyager - полностью одетый турист с обтекателем, пластиковыми кофрами по бокам и сзади, ступенчатым сидением для водителя и пассажира, цифровым спидометром, радиокассетной декой и бортовым компьютером для нужд поездки и топливных расчетов. Voyager был хитом среди серьезных гастролеров на большие расстояния, несмотря на его высокую цену по сравнению с конкурентами. По прошествии 12 лет (1978-1989) выпуска Z1300 - первого мотоцикла с шестицилиндровым двигателем жидкостного охлаждения, Кавасаки прекратила его производство в 1989 году, выпустив за означенный период 20000 Z1300 роадстеров и 4500 Вояджеров. Сегодня, когда в производстве мотоциклов используются суперсовременные материалы и технологии, Z1300 по-прежнему остается популярным выбором для многих байкеров. На то время это был самый тяжелый, около 420 кг. мотоцикл, однако при мощности 130 л.с., чего было более чем достаточно, чтобы развивать скорость более 230 км/час (145 mph), он быстро сыскал себе поклонников во всем мире. Dual Kayaba shocks, fully adjustable. Front Suspension 41mmKayaba air adjustable forks Rear Suspension DualKayaba shocks, fully adjustable. Colour vintage red and metallic greystone. 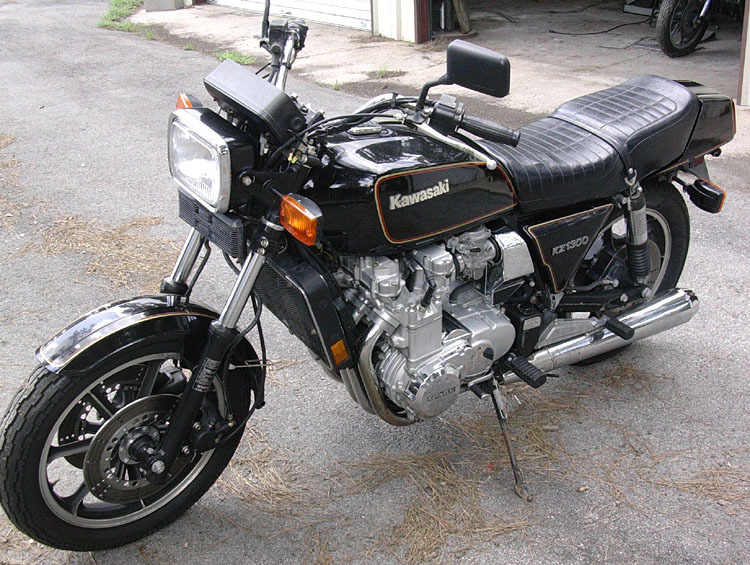 Kawasaki eventually replaced the ZN1300 with the 1200cc four cylinder Voyager which was lighter and better equipped. Kawasaki в 1998 году приняли решение заменить таки шестицилиндровый ZN1300 Voyager на четырехцилиндровый Voyager с объемом двигателя 1200cc, дав ему название Voyager XII, который был и легче и лучше оснащен. Мощность: 97.00 л.с. (70.8 кВт)) @ 7000 об./мин. Крутящий момент: 11.00 Нм (1.1 kgf-m / 8.1 ft.lbs) @ 5000 об./мин. The Voyager XII is dedicated to the concept of worry-free, comfortable touring with smooth shaft drive, wide seating areas, adjustable controls and on-board hi-fi stereo system. The Blue Ridge Parkway is gorgeous in summer. So why not go? 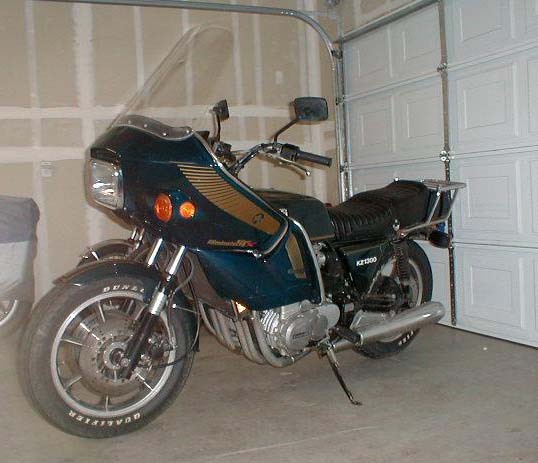 You’ll want to, when there’s a Kawasaki Voyager® XII waiting in the garage. 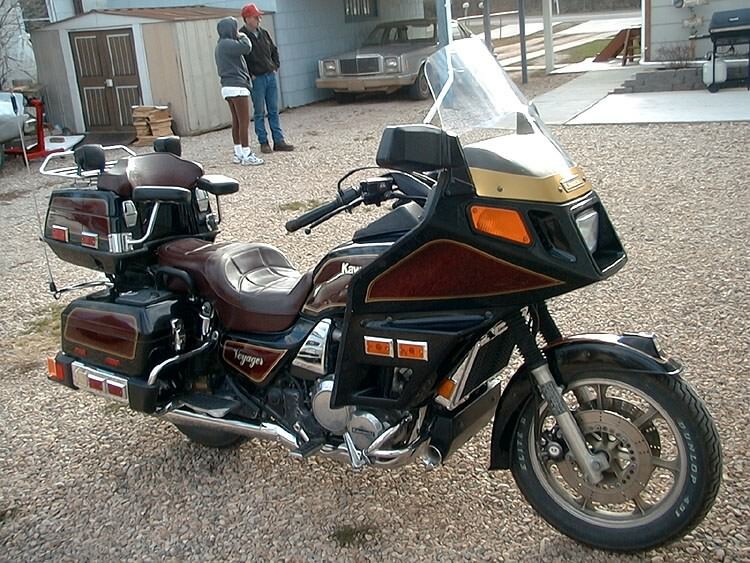 So pack the top-loading saddlebags and trunk. Then start up the 1,196cc In-Line Four DOHC engine, settle in behind the aerodynamic fairing and let dual gear-driven engine balancers and fully adjustable suspension provide an incredibly smooth ride. 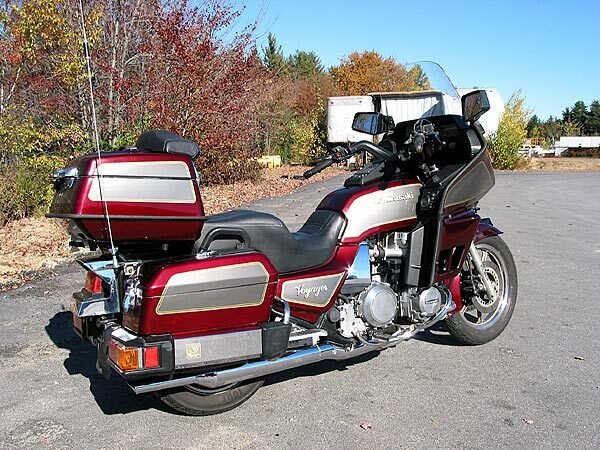 And head the Voyager XII toward the Parkway’s 469 miles of motorcycling paradise. Long, relaxing days in the saddle are what the Kawasaki Voyager® XII motorcycle was built for. 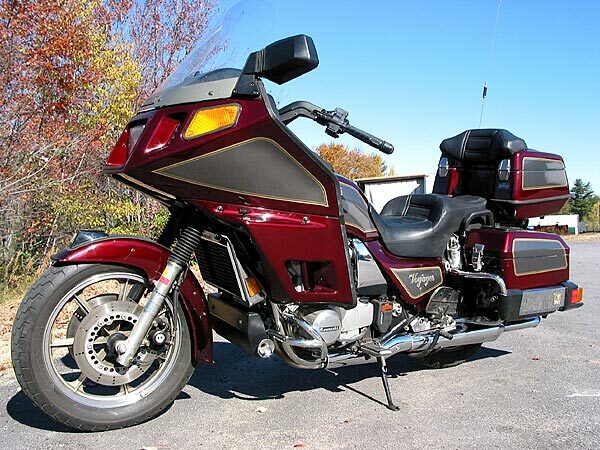 This machine lays claim to all of the features of a luxury tourer, from its spacious saddlebags and large rear trunk to its massive full fairing with wide windshield and deeply cushioned seat that's good for all-day cruising comfort. Passengers also benefit from an equally comfortable seating position, with grab rails, their own floorboards and an adjustable backrest. Truly, the Voyager pampers all of its riders. Your new Voyager XII or Concours comes with a 36 month/ unlimited mileage limited factory warranty. Ask your dealer for details about the factory warranty and available extended coverage. - With standard features like electronic cruise control and a high-quality 4-speaker, AM-FM cassette stereo with dual remote controls, this land is your land to enjoy. - The extra strong Voyager XII powerplant delivers dependable touring power for effortless over- taking or hauling heavy loads up high-altitude mountain passes. - Dual integrated balancers plus rubberized engine mounts make the massive 1,196cc DOHC In-Line Four cylinder engine purr along smoothly. - Meticulous attention to keeping maintenance chores to a minimum: Reliable vacuum-advance electronic ignition. Automatic cam chain adjuster. Hydraulically controlled automatic valve lash adjusters. - Clean, quiet shaft final drive. - Making the Voyager fit you is easy: Air-adjustable front and rear suspension. Individually adjustable rider’s seat. 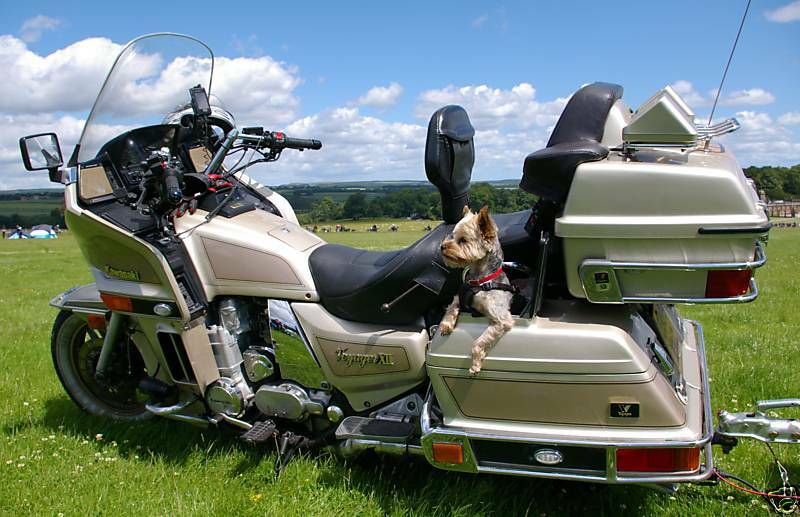 Adjustable passenger backrest. Adjustable windshield. Adjustable handlebars. - Delivering extended touring range from the 6.1-gallon fuel tank is an ‘overdrive’ top gear. - The full coverage fairing knifes through the air and leaves both the rider and passenger in a cocoon of calm and quiet. 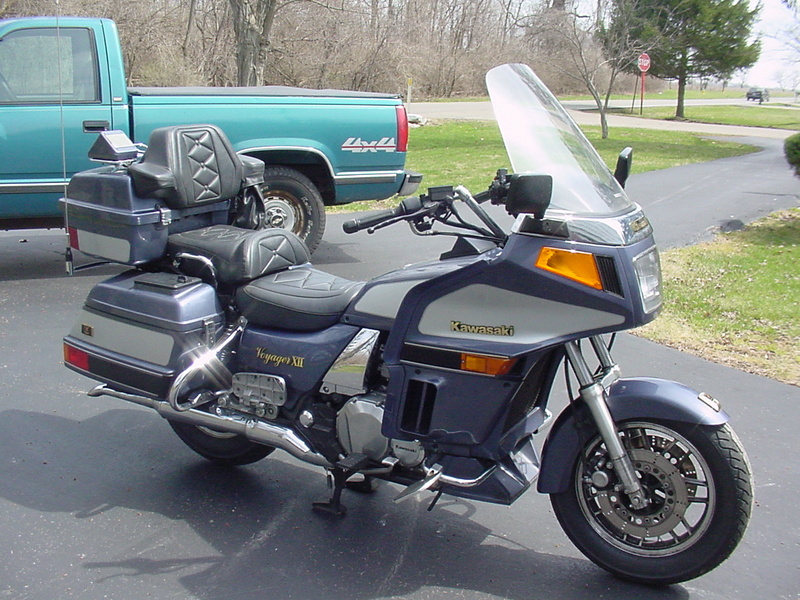 - Luggage capacity is one of the Voyager’s strong points: The dual top-loading saddlebags complement the huge trunk. Ссылка не обязательна, однако все права защищены!